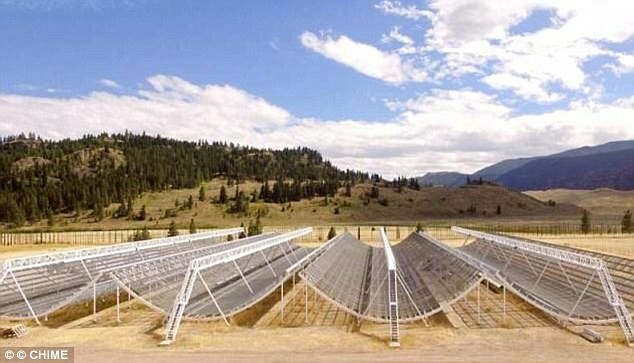 A brief burst of radio sent from an unknown source across the universe has been picked up by the state-of-the-art CHIME telescope in Canada. 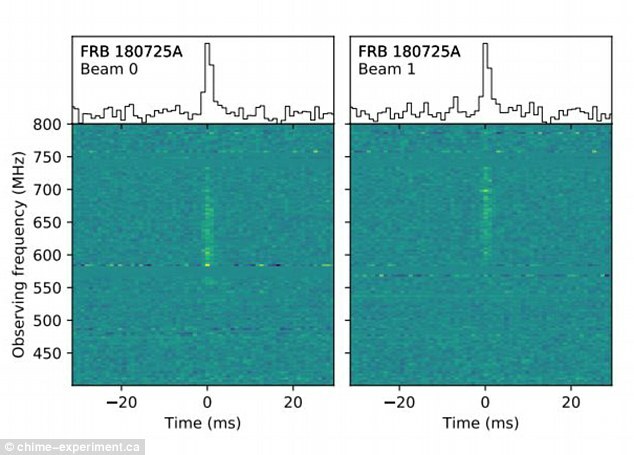 The signal, known as a Fast Radio Burst (FRB), lasted only a matter of milliseconds. Researchers claim the signal is the first radio emission received from across the universe with a frequency below 700 MHz – the lowest frequency FRB ever recorded. As a result, scientists believe that whatever produced the signal, which has been branded 'FRB 180725A', is likely to be extremely powerful. FRBs are extremely uncommon, with the abrupt radio emissions first discovered in 2007 and only two dozen examples recorded since. Experts are still investigating what causes FRBs, with possible explanations including exploding black holes and advanced extra-terrestrial civilizations. The radio emission was first detected by the Canadian Hydrogen Intensity Mapping Experiment (CHIME) telescope, which has been in operation for less than a year. The FRB was detected by CHIME's expansive, four 100-meter-long (328ft) U-shaped cylinders on July 25 2018. CHIME is designed to be able to record signals sent when the universe was between 6 billion and 11 billion years old. Patrick Boyle, of McGill University, first reported the detection of the low-frequency FRB with a post on the astronomical publication 'Astronomer's Telegram'. Professor Conselice told MailOnline that FBRs likely happen regularly, and probably reach Earth thousands of times a day. Until now however, human tools have only been able to detect the highest energy emissions. He said that CHIME's highly-sensitive tools made the discovery possible, and the short bursts of radio waves will become more commonly spotted as technology improves. According to researchers at CHIME, whatever produced the signal in the depths of space is likely to be extremely powerful. Whatever the source, it has produced the signal a number of times, scientists say. Research into FRBs is still in its infancy, with the first signals detected less than a decade ago. Since then, a mere two dozen FRBs have ever been detected from Earth, meaning there is little prior research for scientists build on. The mystery around these signals stems from the fact that scientists cannot yet pinpoint what is capable of producing such a short and sharp radio wave burst. 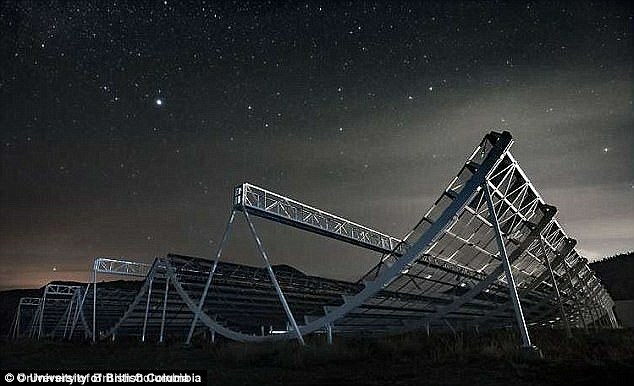 CHIME is 'half-pipe' design radio telescope that contains four 100-meter-long (328 foot) U-shaped cylinders, allowing it to detect signals from when the universe was between 6 and 11 billion years old. 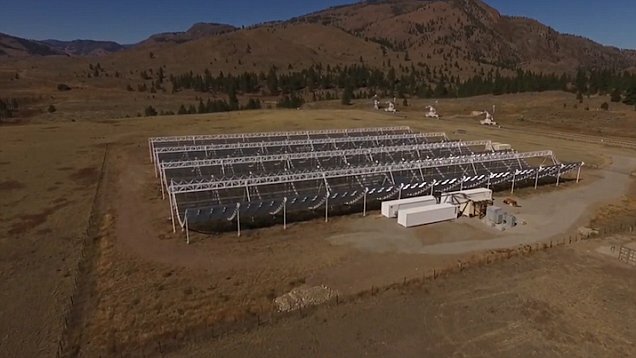 The £12.2 million ($16 million) in funding, CHIME sits in the mountains of British Columbia's Okanagan Valley at the NRC's Dominion Radio Astrophysical Observatory near Penticton. With its U-shaped cylinders made of metal mesh, it resembles the half-pipes used by snowboarders and skateboarders. Its unique design, coupled with advanced computing power, will serve as a 'time machine' to peer deep into the history of the universe. This could help scientists to better understand the history of the universe, mysterious fast radio bursts, and the detection of gravitational waves. CHIME will collect radio waves with wavelengths between 37 and 75 centimetres. This, according to the researchers, is similar to that used by cell phones, and will allow the telescope to pick up on extremely weak radio signals from the universe. Most of these signals come from the Milky Way, but, some began their journey billions of years ago.